There are several rail providers across the UK & Europe but the services between Birmingham in England to Bournemouth in England are operated by Cross Country. The train is a quick and simple solution to travel to Bournemouth from Birmingham. The average train time from Birmingham to Bournemouth is 3h19m to cover the 122 miles. Looking at our data, the best price to travel by train in the next 30 days is £29.95. This fare is based on an adult fare and is not including the savings you can make with a discount card. Find the cheapest tickets to travel from Birmingham to Bournemouth by train, bus, ride sharing and plane. The Prices for train tickets Birmingham to Bournemouth will increase if you don't book early. If we look at our data, if you book your seat 1 month in advance, tickets should be available from £28 whereas when buying your ticket on the day you're travelling, you will need to spend at least £59 for your journey. Thus, you can save 53% on the price of your ticket by purchasing your seat 1 month in advance rather than on the day you're travelling. We compare train ticket for all major companies to travel between Birmingham and Bournemouth by train and find the best prices for the coming days. Take a look at the prices of train tickets Bournemouth to Birmingham and find the best deal for your outbound journey. The easiest way to pay less on your Birmingham Bournemouth train ticket is probably to buy a railcard. While regional railcards are available in some areas, National railcards enable you to spend less on most rail fares across the UK. Everyone is eligible to at least a certain railcard, even non-UK residents. National railcards available: 16-25 discount card, Senior railcard, Two together discount card, Family and Friends railcard and Disabled persons discount card. For instance, train tickets from Birmingham to Bournemouth cost on average £62.49 (1). 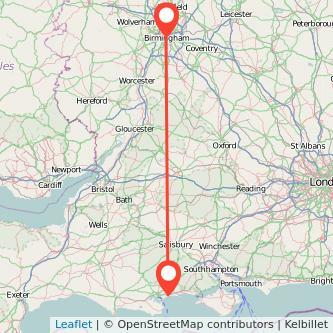 If you're dividing £88 by £62.49 (£88/£62.49 = 1.41), it turns out that after only 2 one way trips from Bournemouth to Birmingham, the card will have paid for itself. The price to purchase a Disabled persons railcard is £20 while it will cost you £30 to get the 16-25, Two together, Family and Friends or the Senior railcard. All of them enable you to save 34% off most train fares for an entire year.